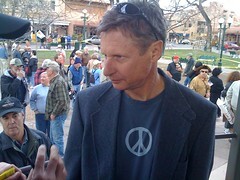 Gary Johnson, a political unknown when he announced he was running for governor in 1994, surprised many when he won the Republican primary for governor that year. But now a new poll shows a Johnson victory in a GOP primary next year also would be surprising. PPP, a North Carolina Democrat-affiliated company which polled New Mexicans earlier this month, showed the former governor would have a hard time in both the presidential primary or the U.S. Senate primary. Johnson -- who has shown no interest in a Senate race -- would lose to former U.S. Rep. Heather Wilson in a Senate primary. In a New Mexico presidential primary, Johnson would finish behind Sarah Palin, Mike Huckabee and Mitt Romney, tying with Newt Gingrich for fourth place. PPP surveyed 357 usual New Mexico Republican primary voters from February 4-6. The survey’s margin of error 5.2 percent.